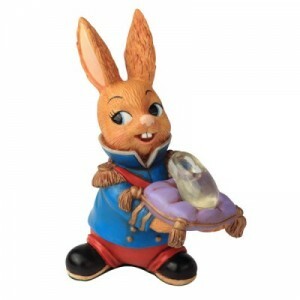 PenDelfin make hand painted stonecraft bunnies. The company was started by Jeannie Todd and Jean Walmsley Heap who began making animal models as gifts for friends. Their workshop overlooked by Pendle the legendary Lancashire Witch Hill. The early figures had an elfin appearance and the PenDelfin factory was born. The company began in the 1950s with the first piece, The Pendle Witch being produced in 1953 by Jean Walmsley Heap. The company were based in Burnley, England for many years and in 2004 production moved to Briercliffe. The PenDelfin brand is now owned by Collectables, a leading giftware trader in the North East England and a leading customer of brand. 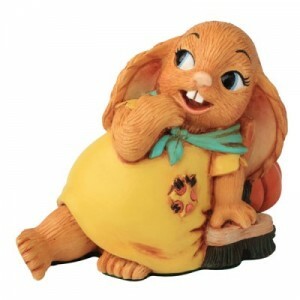 The bunnies enjoy worldwide popularity, and have become extremely collectable. There is a very active secondary market for earlier and short run pieces. One exclusive model Dot Com sold at auction for around £6000. The PenDelfin Family Circle started in 1992 and offers members a range of benefits. These include a Membership Gift which for 2012 is the “Charming” (above right), the partner piece to the exclusive Member’s Model of the Year called “Rella” (left). Members also receive The PenDelfin Times two times a year which offers news and stories from around the world. 2012 will be the final year of the PenDelfin Family Circle as it has been announced that the club will close on 31st March 2013.